They’re sweet and light and just the right amount of cute to chase away any storm-related blues. They also take a little longer to make than a regular biscuit, so they’re a good distraction if your power is off/you can’t leave the house. These biccies are perfect for sharing. I’ve got this theory that nobody can resist sprinkles – I took them into work the next day and my suspicions were confirmed! Have you ever had to bake away the grey? What’s your solution to stormy weather? Whisk together the corn syrup, butter and vanilla until smooth and creamy. Add in the cups of icing sugar, one at a time, mixing thoroughly after each addition. You’ll need to keep scraping down the sides so that all of the icing sugar is incorporated. Add the water half a tablespoon at a time if the mixture needs some encouraging to becoming a cohesive ball. Shape into a ball and pop in the fridge for 30-60 minutes to firm up. While the fondant is in the fridge, make a start on the sugar cookies. Cream together the butter and sugar until pale. Add in the vanilla and egg and mix until combined, scraping down the sides of the bowl if necessary. If you’ve got a dough hook, now is the time to use it. Mix in the bicarb and add the flour. Keep mixing until you’ve got a cohesive ball of dough. You may need to add some of the water to help the dough pull together, but use it sparingly. Shape the dough into a disc and wrap in cling wrap. Pop in the fridge for 15-30 minutes. Take the dough out of the fridge and roll out to about 1/2 cm thick on a lightly floured surface. It often helps to lightly flour rolling pin as well. Grab your cutters and get to work, setting the dough on the baking trays as you go. You don’t need to space them too far apart as they won’t spread. Pop the baking trays into the fridge for a further 15 minutes so that the biscuits keep their shape. Preheat your oven to 180­°C and pop the chilled biscuits in the oven for 12-15 minutes. Remove from the oven and allow to cool for a few minutes before carefully transferring them to a cooling rack. Keep spreading cornflour underneath the fondant so that it doesn’t stick to the work surface. Roll out your fondant to about 1/2 cm thick (yes, the same thickness as your biscuit!) and cut with the same cutter you used for the biscuit. Set in the fridge until you’re ready to use them. Make the glue icing by putting the icing sugar in a bowl and mixing in one teaspoon of water at a time until you get a runny icing. It doesn’t need to look nice, it’s only going to act as a glue. Once your biscuits are fully cooled, spread a thin layer of glue icing over the biscuit but leaving a 1/2 cm border un-iced so that when you put the fondant on the glue icing isn’t visible. Press your iced biscuit face down onto the backs of one of the pieces of fondant and press the back so that they bond. Turn the biscuit the right way up and neaten up the fondant. Set to one side. Repeat until you’ve done all of your biscuits. 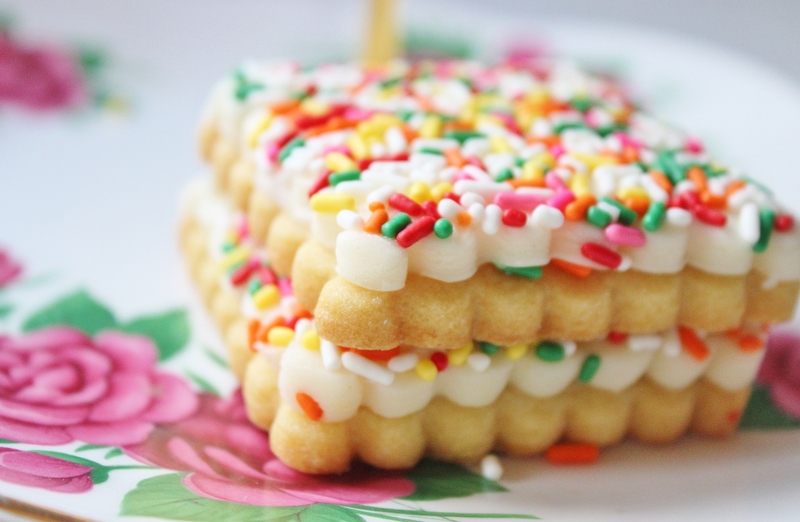 You can decorate your freshly fondanted biscuits any way you want – I opted for sprinkles. To do this, grab a pastry brush and a small amount of water, then pour your sprinkles into a small dish that you can dip your biscuits into. Brush your fondant with a small amount of water (making sure you cover all the way to the edges) and then press the fondant into the sprinkles, then repeat with the remaining biscuits. Allow the water to dry for about ten minutes before serving. These babies will keep in an airtight container for about a week, but I bet you they’ll be eaten before then! Pps. 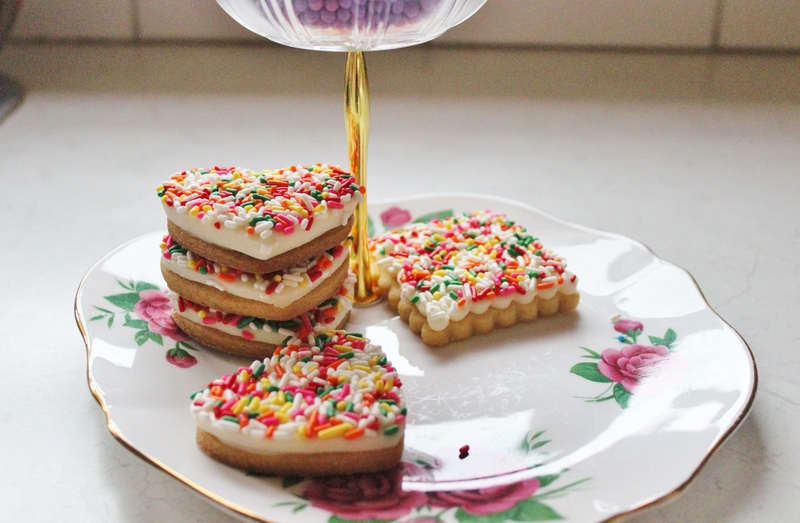 If you’re admiring my cake stand, it’s from the fabulous Three Birds Vintage Cake Stands. These are so pretty! You’re very talented. My grandsons love ice cream with sprinkles. I might surprise them with a fairy bread biscuit?